We designed this destination guide to help you learn about the La Parva Ski Resort in Chile. Let’s dive right in. La Parva’s ski season kicks off in June! Where is La Parva Chile? La Parva resort, based at 9,000ft in the high Chilean Andes is just 45 miles from downtown Santiago and the Comodoro Arturo Merino Benítez International Airport (airport code SCL). 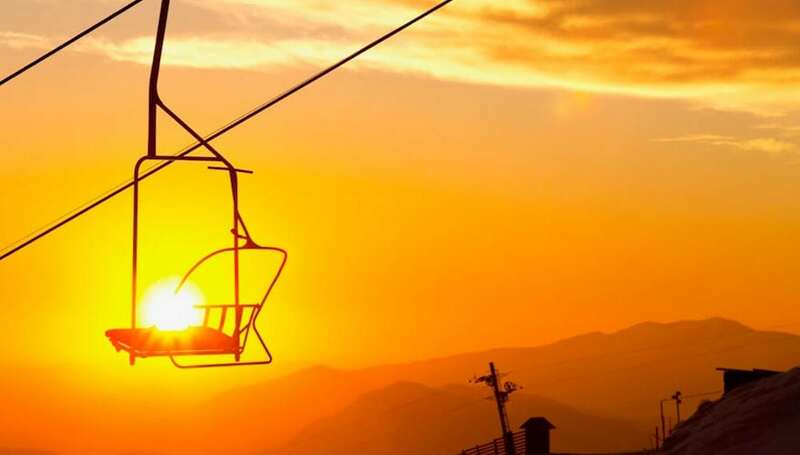 Travel from Santiago to the La Parva ski area, generally takes 1.5 hours from downtown Santiago. This varies based on the road conditions, transfer company and day of the week. The road known as, G-21 from Las Condes, has many switchbacks on the climb, with thousands of feet of elevation gain. The road splits as you arrive to the entrance to the Farellones Village. If you continue straight, this road takes you to Valle Nevado Ski Resort. Going to La Parva, you want to turn left into Farellones, by pass the busy parking lot of the small Farellones ski area, and up to yet another main fork in the road. Turn left to get to the La Parva base area. (Turning right will take to El Colorado resort. The cheapest way to get to the mountains. If you are on a budget and have the extra time and patience to pick up other passengers around congested Santiago, and more patience as they drop them off at the different ski centers, this can be a reasonable way to arrive. Details are online or booked directly from the airport. We encourage you to do your research here. Trip Advisor has lost trust to many savvy travelers recently, but their site can be a start to find a shuttle company to get you to La Parva. Renting a SUV or 4×4 short-bed truck is an option from Santiago and the airport. If you are staying off the mountain (down in Farellones for example) or you are visiting several areas during your trip a vehicle can be worthwhile. Note that gas is expensive, the roads are not easy to drive, and you will need to carry snow chains, even if you have 4×4. This is enforced by the local police. An international drivers license is needed to drive in Chile. Pick one up at your local AAA (USA drivers) or CAA in Canada. Hitching a ride up to the mountains is not that challenging. Have patience and you will eventually get a ride, at least up to the village of Farellones. Best location is a few hundred feet up the G-21 (road to Farellones) after it branches off from Avenida Las Condes. There are some ski rental stores where you can try to find a ride from those stopping on the way up the mountain. One of my favorite runs in La Parva is a short hike above the Las Aguilas lift. Once you gain the ridge after about a ten minute hike, you can either drop in to some powder chutes to your left, or hike up 20 more minutes and ski the massive bowl back down above the lift. The terrain is really scenic and the skiing can be really steep or relatively mellow. On a low snow year you have to be careful with route selection but there’s always something to ski from this spot. 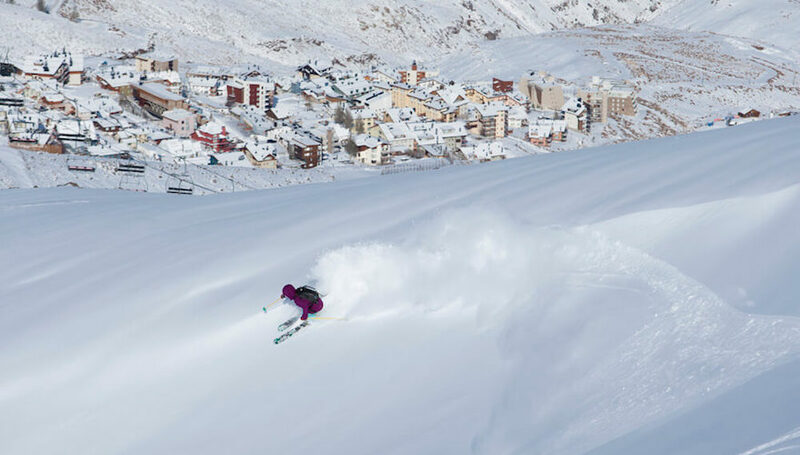 La Parva, the smallest of the Three Valleys resorts packs a punch. It has great skiing and snowboarding for beginner to expert – with a huge swathe for intermediates and advanced-intermediates – a terrain park, and amazing access to the Andes backcountry. The ski season runs from June to late September, and on a good year can extend into October. La Parva often has the least expensive lift tickets of the resorts in the area. It’s not uncommon to share the ski lift or an Apres-ski pisco sour with some of the best pros on the Planet. La Parva ski village has recently hosted unique events like Eye of the Condor and the PowderQuest Women’s Freeride Camp with Ingrid Backstrom. Their FIS-approved downhill courses are used for training by international teams including the USA, France and Slovakia. In addition, Jeremy Jones spends seasons snowboarding La Parva and testing his future Jones Snowboard models. What is The Ski Terrain Like at La Parva? La Parva’s terrain park is located next to the Tortolas run with it’s own lift. The 32,500 square meter area hosts a mix of features and jumps, aimed to give skiers and riders the ability to improve and progress in their freestyle. The park also features an airbag jump open to guests, weather permitting, to give them an opportunity to learn new tricks in a safe environment. With a total length of 450 meters, the park is a large improvement compared to previous ski seasons. After tracking out the fresh snow inbounds, experts head off-piste into the La Parva backcountry for their kicks, to the chutes like the famous tight, steep and long couloir La Chimenea, and McConkey’s, so named as a tribute to Shane McConkey in 2009. There are plenty of deep powder bowls, and cornices, which is why this has been the location of Freeskiing championships and host to the Eye Of The Condor film and photo event. Backcountry touring and exploring is pretty much endless as you head east and north of the resort. Just remember cell phone service is very limited once leaving the ski area. It is highly recommended to let the ski patrol know where you are heading and always check in quickly upon your return. Cerro La Parva Falsa has some great skiing for those willing to do some hiking. Alpine faces and couloirs are the reward to those willing to work up a sweat. Manantiales is the powder playground for those who aren’t up for hiking. Just make sure you get your timing right or you could be in for a very long run of windslab or crust. There is plenty to play on for low level and high level intermediates, with endless amounts of rolling groomers it is an excellent place to get some high speed turns in during the summer months. 25% of the resort’s runs are beginner groomed slopes, in addition to their dedicated beginners area of Manzanito that is close proximity to the village base. For those not skiing, there is not a lot to do here except to eat, drink and be merry. Hotels and Lodging: Condominiums, Apartments and private homes available for rent around the base area, or you can stay 15 minutes away in Farellones. Night Life: bars and pubs open nightly at the base, plus Farellones, just 15 minutes away has some great nightlife. If you are having trouble finding Ski La Parva hotels, it is because they do not exist! No hotels in La Parva, just private apartments and condominiums for rent in the village. The village has more of a small remote mountain village feel with nice amenities. Although it has minimal dining options the few that are available are top notch especially the fondue at La Marmita and Pisco Sours next door. The underrated and least crowded of the 3 Valleys. Pisco sour at sunset on the deck of El Montañes will excite the soul and fondu and red wine at La Marmita will warm you up nicely for the next day! The Eye of the Condor, a weeklong film and photography contest, was an annual event that quickly grew in popularity over the three year run, 2011-2013. Teams were challenged to produce the best short film and photography, in a celebration of skiing and mountain culture in Chile. During the week long event, La Parva hosted many parties and events that included professional international athletes and were open to the public. It has not been announced if there will be an Eye of The Condor in the near future. Day lift tickets at La Parva are often slightly cheaper compared to neighboring El Colorado and Valle Nevado, however on mountain food options are more limited, and tend to be a bit more pricey than its neighbors. For season pass holders to any Powder Alliance partner resort, you will receive 3 free days of skiing at La Parva with no black out dates. Weather and snow conditions depending, you can link your day skiing in La Parva to neighbor resorts; El Colorado and Valle Nevado. Linked, the 3 resort combo is known locally as the Tres Valles, or 3 Valleys. Combo tickets are purchased via the lift ticket booths. Be sure to ski with a map as the linking roads and lifts can be a bit confusing at first, especially on overcast or low visibility days. So, there you have our La Parva ski area review. Well worth the visit, especially if you are looking for something more low key and with challenging terrain. If you plan on going or have skied La Parva in the past, leave your thoughts in the comments below.